It’s only 6th January and I must need a break; it can only be paranoia that the transcript of the appearance of the Permanent TSB public interest directors before the Oireachtas finance committee on 19th December 2012, is not yet available three weeks after the grilling by TDs and senators. This despite the fact that the appearance of the Bank of Ireland and AIB directors on 20th December 2012 was made available yesterday, and that it seems the sound is not available on the Oireachtas video record. You see, I though Ray MacSharry told the Committee that the two large bonds that fall due for payment in January and April 2014 and which come to a total of €2.7bn, would be “rolled over”. It is understood that this is not the position of PTSB, but I have been waiting for the transcript for three weeks now. And just to intensify the paranoia, we today have a curiously-timed press statement from PTSB which promises major new lending in Ireland. That is welcome of course, we need credit and the deleveraging by banks, the stricter lending criteria and the basic unavailability of credit have all been strangling recovery. So it’s good news, even if it is being published on a Sunday. The bank has concluded it can increase its lending partly because of the “success in doubling the size of its deposit book to approximately €12 billion in the past few years” but PTSB, or Irish Life and Permanent as it was then, bought €3.6bn of deposits from Irish Nationwide Building Society in February/March 2011, and that accounts for most of the increase, and that is nearly two years ago. Maybe I should just walk around with a tinfoil cap. Today, PTSB says it is providing “approximately €350m into the mortgage market, €100m into personal lending (including car finance) and €5m in new Credit Card finance.” But hang on a second, it was only a month ago when PTSB sold a €300m car loan business to Deutsche Bank at a book loss of €64m – why get back into that business after just selling it at a loss? Maybe I need more than a tinfoil cap. The betting in some parts of the industry has been that PTSB will need an additional bailout and that is politically taboo – not even Leo Varadkar would be able to justify it, after he qualified his “not another red cent” comment during the General Election campaign of 2011 by saying he was referring to a red cent on top of the stress tests in March 2011. After those stress tests, Irish Life and Permanent was bailed out with €4bn of our money. If we have to provide an additional bailout, then some might think that crosses a line. PTSB will be closely watched in coming days. And there will be a blogpost on here when the transcript of the 19th December 2012 hearing is finally published by the Oireachtas. 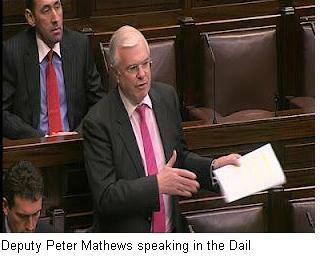 “Deputy Peter Mathews: As Dr. Somers said, the pension fund that was built up for the people of Ireland has decreased. They stupidly raided it. They gave Wilbur Ross 35% of the other bank for €1 billion, when our State paid €5 billion for 15% of the bank. A junior certificate student would know that is stupid. Dr. Michael Somers: Obviously, I do not know exactly who it was. I would have had to swallow very hard to do a deal like that, but anyway the deal was done. Deputy Peter Mathews: I can read between the lines. It is an idiotic deal.” Oireachtas Finance and Public Expenditure and Reform committee hearing with AIB directors on 20th December 2012. Despite criticizing the Fine Gael TD for Dublin South on here on a couple of occasions – here and here, which provoked a response from the deputy himself – it is indisputable that he is one of the 166 TDs in the Dail who does have a lifetime career in banking, and despite having to put up with the verbosity and lengthily-parsed speeches with which he responds to the simplest of questions, the fact is that (a) he is an expert in his field and (b) he is supposedly in a place where he can influence government policy for the greater good of the nation. He was one of the few TDs and senators who really had any prospect of making a mark or developing an argument at the recent Oireachtas hearing with public interest directors on 19th and 20th December 2012, the partial transcript of which was made available online yesterday. Unfortunately, Deputy Mathews was only give 300 seconds to question the directors, about which he complained. “Deputy Peter Mathews: For the record, I am very disappointed that I get five minutes compared to 12 minutes for other speakers. This was the deal where a large part of the State’s stake built up at a cost of €5bn was sold to the US and Canadian investors for just over €1bn, though the deal has a lot of strings attached. Bank of Ireland remains the only one of the banks which the State has guaranteed to remain outside our control as we now have a stake of 15% of the ordinary shares. Deputy Mathews gained a reputation as an Irish Cassandra in 2009 and 2010 where he trumpeted the risks of massive additional losses in the guaranteed banks, and warned against the State covering the losses, lest it beggar the society. Turning up with annual reports on current affairs programmes, he acquired a reputation for being a plain-speaking if somewhat contrarian and verbose commentator on the unfolding crisis, and it was no surprise when he was elected on his first attempt to the Dublin South constituency, nudging justice minister Alan Shatter into fifth place. Deputy Mathews duly took his place on the back benches and observed as political insiders took the key jobs in finance and economics. Although he tells us with a nod and a wink that he talks with Minister Noonan and gives the impression that his views are listened to, it has become obvious that he is a maverick in a conservative political party. He is frequently described as an Independent and in March 2012 was placed in the farcical position of voting against his own proposal at an Oireachtas committee. Describing Minister Noonan’s deal with Bank of Ireland as “idiotic” can only deepen the rift between the mainstream of Fine Gael. Whilst not the focus of this blogpost, Deputy Mathews did assert that there was potentially another €60bn that would be required in the Irish banking system – that’s on top of the €64bn direct bail-out of the banks and the €5.6bn of state-aid paid by NAMA to the banks for the acquisition of loans. It’s going to be a busy year in the courts for property developer and businessman, Paddy McKillen with news today that he is to initiate libel proceedings in Dublin’s High Court this coming week arising from the long-running battle with the billionaire Barclay brothers over the control of the Maybourne hotel group of three luxury hotels in central London; separately, Paddy’s appeal against last August 2012’s judgment by London’s High Court is set to begin in February 2013. And apparently it is still open to Paddy to initiate proceedings in Dublin about NAMA’s sale of loans to the Barclays, since UK appeal judges have rejected Paddy’s application to hold an appeal, in part, because the matter at issue is really a matter for a foreign, that is, “Irish”, jurisdiction. Paul Tweed, the star solicitor at Belfast, London and Dublin-firm, Johnsons is said to be representing Paddy – coincidentally Paul is also representing Sean Gallagher, who on Friday last, initiated proceedings in Dublin’s High Court against RTE over the infamous Tweetgate incident where a bogus tweet was used by RTE in an Irish presidential debate. And Paul was recently representing the X Factor’s Louis Walsh who won a €500,000 pay-out from the Irish Sun. So, what is Paddy upset about this time? Apparently a statement was made by a British PR company, Powerscourt on 30th November 2012 on behalf of the Barclays, which contained something which Paddy regards as, according to the Sunday Independent, “defamatory of him as they questioned his motivation for bringing proceedings before the UK Court of Appeal” in the latter half of 2012. You might recall that following Paddy’s comprehensive defeat in the London High Court last August 2012, he was firstly hit with legal costs which have been estimated at €25m of which he has paid several million already and then he sought, and was granted, permission to appeal the High Court judgment, the appeal was to have been heard before Christmas but, to accommodate the Barclay brothers, has been deferred and the hearing is now scheduled to commence in February 2013. A brief perusal of Powercourt’s website this morning shows that it acts for a slew of Irish companies including Aer Lingus, Greencore, Paddy Power and…. 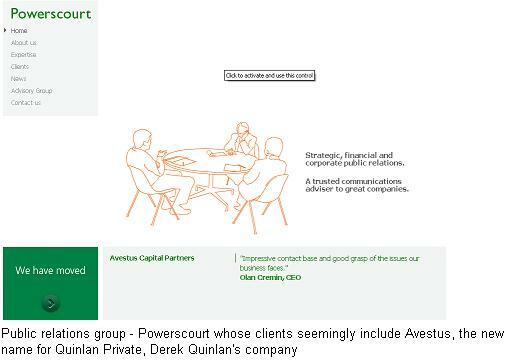 – well, it’s not on the Powerscourt client list but there is a comment from it on the Powerscourt website above – Avestus Capital, the name of the company formerly known as Quinlan Private, Derek Quinlan’s company. We learnt last year that Derek – or “Derrick” as the Barclays call him – is bessie mates with the Barclays who have advanced him over GBP 4m for his personal expenditure; he is the former tax inspector who was for many years a King Midas of property but is now one of the NAMA Top 10 developers and one with severely distressed loans, and against whom, the Agency has foreclosed on certain loans. Paddy is also upset with the company to which NAMA sold €800m of loans relating to the Maybourne hotels. That company, Maybourne Finance Limited was set up by the Barclays to acquire the loans and one of its directors, Philip Peters was cited in the offending Powerscourt statement in November. The Sunday Independent reports that Philip has given an undertaking not to repeat the offending statement but that undertaking is “without prejudice”, presumably to its accuracy about which, there is dispute. The actual offending statement from Powerscourt doesn’t appear to be available this morning, but in the London High Court last year, the Barclays’ legal team were quite beastly towards the scrappy Paddy, suggesting he hadn’t a pot to pee in. Powerscourt is not apparently making any statement, and Maybourne Finance declined to comment on the matter to the Sunday Independent. A request for comment was made from here to Paddy’s spokeswoman but I would say there is unlikely to be any comment forthcoming from that quarter on this matter, either. UPDATE: 26th January, 2013. Paddy McKillen yesterday lodged an application in Dublin’s High Court – reference 2013/799P – where the respondents are named as Philip Peters and Maybourne Finance Limited. Paddy is represented by Belfast solicitors Johnsons where Paul Tweed is the star earner. As this is Dublin and Ireland, we neither know the details of the application nor the remedy sought but the betting is that it will be in connection with the above story. There is brisk business being conducted right now in the trade of Irish loans, which might be surprising to some of you. As a nation of property-crazed maniacs, most of us tend to have an understanding of bricks and mortar, the buying and selling of homes in particular. A smaller group of you will be familiar with the buying and selling of commercial property, and a smaller group still, with development of both existing property or fresh undeveloped sites. But the trade of loans will be a whole new business to the vast majority, even if those selfsame loans are secured on the focus of our national obsession, property. This blogpost looks at the business and the most prominent recent trades. Bloomberg reported on Friday last that €140m of loans had been sold by Lloyds Bank to a US investment management company, Canyon Capital Advisors. The loans are reported to relate to Limerick businessman Tom Moran’s hotel group which includes the Red Cow Inn and Bewleys-branded hotels. The Moran Hotel Group is reported to have a debt mountain of €693m overall. The €140m of book-value loans sold to Canyon, were originally advanced by Bank of Scotland (Ireland) which closed itself to new business in 2010, and is now running down its loan book, partly in conjunction with asset manager, Certus. Although not confirmed, Bloomberg claim that Canyon bought the Moran Hotel Group loans at a 70% discount, that is, paid just 30c in the euro. If confirmed, it is but the latest in a long line of major disposals of Irish loans, some of which are detailed below. There was speculation that NAMA was readying for sale in 2013 a major portfolio of loans, perhaps with a value of up to €1bn, secured on Irish property but regardless whether that is correct or not, NAMA confirmed in a parliamentary question last October 2012, that it has, since inception in 2010, sold nearly €2bn of loans. NAMA is very coy about its loan sales activity and refuses to provide a breakdown but also refuses to reveal its procedures which might give us comfort that it is maximizing prices on our behalf. The view on here is that the Maybourne, Mulryan and Dennis loans would account for the majority of NAMA’s loan sales to date. Loan sales distinguish themselves from refinancing, for example, both David Daly and Bill Durkan have refinanced loans out of NAMA, that is, they convinced other lenders to lend them the funds to repay their loans to NAMA though now, they have loan obligations to the new lenders. There has also been speculation that NAMA has been readying a billion euro US loan portfolio for sale through US loan sales company, DebtX. NAMA denied the story at the time, late last year, but speculation has persisted. IBRC has already reportedly engaged UBS to advise on the imminent disposal of €2bn of corporate loans – business loans, mostly to Irish businesses. AIB recently pulled the sale of €125m of loans secured on UK property after bids fell short of expectations. Earlier this year, Permanent TSB pulled the sale of €8bn of UK mortgages for the same reason. Outside Ireland and the UK, there has already been over €10bn of loan sales in North America by Anglo, AIB and Bank of Ireland. Minister for Finance, Michael Noonan responded to a parliamentary question after the AIB/EBS sale of loans to Lone Star to say that borrowers would continue to be covered by their existing loan contracts, but some of the buyers are completely unregulated in Ireland. In the UK when NAMA sold the €800m of Maybourne loans to a company controlled by the billionaire Barclay twins, the vehicle set up by the Barclays was Maybourne Finance which had the single objective of acquiring these loans. Paddy McKillen went to the UK’s High Court and claimed that his loan terms with Anglo, now IBRC, stipulated that he should be consulted before loans were sold and that there was a restriction on the type of company that could acquire his loans. Paddy was successful in the UK’s High Court but the judgment was appealed and NAMA won the appeal, Paddy then sought application for a further appeal but was unsuccessful with the judges, in part, saying, because NAMA was a foreign matter, the matter that Paddy said was at issue wasn’t worthy of court time in the UK! It seemingly remains open to Paddy to seek to have the matter determined afresh in the Irish courts. What drives trade in loans? What some of the audience on here might wonder, is why anyone would sell or buy a loan; after all, if John gets a loan of €1,000 from Bank A and agrees to pay that back with 4% annual interest over a period of three years, then why would Bank A want to sell that loan, and why would Bank B or Investor B want to buy it. There are a number of factors which drive the loan sales business – Bank A might want the €100 back right now and not in three years, and if it can’t get €1,000 it might accept a discount, Bank A might doubt that it can get the €1,000 back from John and it doesn’t want to deal with chasing the debt or repossessing an underlying asset, or Bank A figures it can get more from selling the loan now than it can get from John. In the case of Ireland, during the credit and property boom of the 2000s, lending by Irish banks got completely out of kilter with deposits held by banks and we had lending that was in some cases more than 200% of deposits; under the auspices of the bailout Troika, that percentage is to come down to 122.5% by the end of 2013, but that target may slip. In practical terms, most buyers of loans get the loans at a discount to their face value, and as businesses, the buyers hope to earn a profit from better management of the loan, or should the loan be foreclosed and underlying security seized, that the consequent disposal will yield a profit. That’s the market – there was a special status buyer of the Maybourne loans and it is ultimately after control of the Maybourne group of hotels in London. There are the original lenders which are mostly banks and building societies, but following the acquisition of €74bn of book-value loans for €32bn, NAMA has become a potentially major player. In There are buyers which comprise a mish-mash of other banks, private equity and general investment companies, property companies and the odd special purchaser as in the case of the Maybourne loans. There are then, a host of intermediaries from lawyers to consultants offering advice and completion services including due diligence and verification of property titles. Then there’s the sales and marketing; in the recent sale of €21m of face-value loans relating to Paddy Kelly’s loans secured on the Hotel Phoenicia in Valletta, Malta, property services company Jones Lang LaSalle was engaged to market the loans. There are also auction companies – or “trading exchanges” – like DebtX in the US and HLIX in the UK. And some of the buyers seek finance for purchases, so there is a further hierarchy of providers of financing. NAMA was setting up so-called Qualifying Investor Funds in Ireland to transfer some loan and property assets but the status of these plans is now uncertain in light of the recent ministerial announcement to introduce Real Estate Investment Trusts to Ireland. We should be questioning NAMA’s disposal of loans. NAMA doesn’t need the cash right now, it has until 2020 to work out its loans. NAMA is supposed to be a specialist asset manager where most of the underlying security is property, so if NAMA is selling its loans to another loan manager, then we are entitled to ask what is NAMA lacking. And NAMA should now be a specialist in loan recovery, foreclosure, asset tracing, and in all the other specialisms particularly needed with distressed loans. If 99.8% state-owned AIB did indeed sell the €660m of Irish loans secured on Irish commercial property to Lone Star at a 60% discount, we are entitled to ask why. Of course, AIB has so-called “deleveraging” targets where it must dispose of loans under the deal with the bailout Troika, but why didn’t AIB simply dispose of the loans to NAMA which is, after all, set up for that very purpose and has a spare €22bn of unused NAMA bonds – provided for under the European Commission-approved NAMA Act which allows the issuance of €54bn of bonds, of which only €32bn have to date been issued – which only cost the Agency 0.75% per annum. Why did this State give Lone Star a reported €410m discount on AIB loans if NAMA was available as a receptacle which would have another eight years to deploy its expertise in working out the loans? What is baffling on here is the almost-complete lack of political oversight in the disposal of loans, it seems politicians don’t understand these disposals to be of state assets just like our stakes in Aer Lingus, Bord Gais Energy or the ESB. In the case of NAMA, we have instances where there is a perception of developers benefitting from the loan sales; Donal Mulryan is understood to be working as a consultant with the buyer of his loans, Morgan Stanley and it shouldn’t be a surprise if his annual rewards are far higher than the €200,000 cap that applies at NAMA. There is also a concern that NAMA will sell loans to a third party who might sell them back to the original developers. UPDATE: 6th January 2013. It is being reported today that NAMA has offered for sale loans relating to the Adare Manor hotel and complex in Limerick for sale, and that 20 bids have been received. “At least” €13m is needed to secure it, says Tom Lyons in the Sunday Independent. The Limerick Leader provides extensive background on the loans here and says the disposal is tied to embattled 53-year old US investor, Tom Kane’s financial woes.